Aptech wins Award for 'Best Placements amongst Aviation Academies in Mumbai'! Aptech Aviation & Hospitality Academy has won an Award for 'Best Placements among Aviation Academies in Mumbai'. 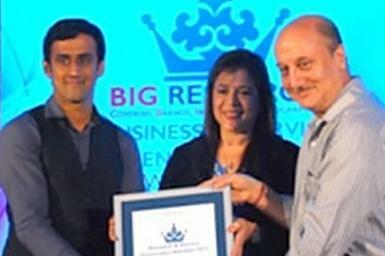 Anupam Kher, Honorable Guest at BIG BRANDS RESEARCH - Service Excellence Award Ceremony, presented the award to Gloria Shroff, Assistant Vice President (Placements - Aptech Aviation & Hospitality Academy) & Asghar Syed (Regional Placement Head - West Zone, Aptech). The Awards Ceremony was held on Saturday, July 7, 2012, at Hotel Four Points, Vashi, Mumbai. The Award was given to Aptech because the Academy achieved the Best Placements for students in airlines, airports & GHAs in Mumbai.